Candid Commentator: Land of the Free? The first verse of our national anthem ends with a plaintive question, “O say! Does that Star-Spangled Banner yet wave o'er the land of the free and the home of the brave?” I say “plaintive” because the longer our country exists, it seems, the less freedom we possess. When I first learned to drive, the daytime speed limit posted everywhere in Kansas outside of cities was seventy miles per hour. When the Kansas Turnpike first opened, the speed limit was eighty. On January 2, 1974 during the administration of President Richard Nixon we lost that freedom everywhere, and it has never been fully restored. If we are to be law-biding citizens, we can only drive fifty-five on many two-lane roads. When I first began to drive, I was not shackled by a harness that I had to wear. As a small child I stood up in the back seat sometimes so I could see where we were going. No more. That freedom has been taken away from us by a government that treats us as would an over-protective mother. I used to ride in the back of my grandfather’s pickup. We had great fun back there, although I didn’t care for the exhaust smell sometimes. But I can’t offer that treat to my own grandchildren. I hate to think of the fine I would have to pay if a trooper spotted me doing that. 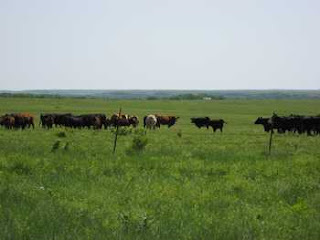 I live here in the vast expanse of the Flint Hills. It’s not hard to imagine a Conestoga wagon or two heading over a distant hill in pursuit of a livelihood out west. Just imagine the freedom the pioneers enjoyed. They didn’t have to pay any income or social security or Medicare or Medicaid tax. They weren’t confined by seat belts or speed limits. They were rugged and hardy. If they survived, it was because they were self-sufficient, self-motivated, and they planned ahead. They had no government safety net to fall back on. They had the freedom to succeed and the freedom to fail. If they failed, they had no one but themselves to blame. I used to joke that one day the government was going to dictate to me how and when and with what I had to brush my teeth. In the present climate to nationalize healthcare, that joke may become a grim reality. Which leads me to my point. If you put your trust in man and man’s way of doing things, it will inevitably lead to loss of freedom. Man is not basically good as he was originally created. Something has happened that has seriously corroded his initial goodness. Now, too often, man is a tyrant. He likes to dictate to others how and where and when and if they shall be permitted to live. In short, he likes to control others. The brief history of the Obama administration sadly illustrates my point. Jesus said, referring to himself, “If the Son makes you free, you will be free indeed” (John 8:36). Ultimate and complete freedom will never accrue to us humans and our society until we choose to link up with King Jesus. Some day He will return, and I look forward to the freedom that will ensue to all who cast their lot with Him. That’s the only thing that keeps me going as I watch our freedom in this country slip through our collective fingers.